20+ Pink Bridal Lehengas that stole our hearts this wedding season! A pink bridal lehenga has an altogether different charm to it which explains why ‘pink’ is the most popular lehenga colour seen on real brides. It’s versatile ranging from hot pink, dusty pink. pastel pink and more and almost all of them look breathtaking. If your heart too skipped a beat when you saw Anushka Sharma in that blush pink bridal lehenga, and decided to wear a pink bridal lehenga for your wedding as well, then keep reading. If I’m talking about pink bridal lehenga, Anushka Sharma’s blush pink and Ivory lehenga which she wore for her private wedding in Tuscany has to be first on the list. This Sabyasachi renaissance embroidery in vintage English colours embellished with silver-gold metal thread, pearls and beads will forever remain a classic. Fuschia pink bridal lehenga paired with a pastel pink dupatta is always a stunner. I am totally crushing over the floral motifs and the zari embroidery on this lehenga skirt paired with a heavily embellished choli. This bride completed her bridal look with sheer double dupattas with one being in the same colour family and another being a light pastel pink shade totally setting some fresh goals! In love with this bride’s hot pink bridal lehenga which she wore for her sangeet. How stunning is her majestic lehenga skirt flare? Love teh tight fitting choli along with the lehenga skirt and the way this bride carries it off without any dupatta! Total mehndi goals! Sonam Kapoor Ahuja choose to wear a stunning Anuradha Vakil creation with hints of pastel pink and grabbed eyeballs with how radiant she looked. Also, only a fashionista bride like Sonam could’ve pulled off the shades of pastel pink, lilac, peach and white lehenga colour combination heavy gotta patti work and look that phenomenal in her mehndi function! Also, right after her Anand Karaj, Sonam changed into a much relaxed pastel pink bridal lehenga and looked gorgeous. Looks, like Sonam loves pink a little too much. How dreamy is this pink bridal lehenga with multi coloured thread embroidery and golden zari work on it? P.S. can’t get over her stunning choli with golden latkans and that statement choker. This bride wore a dusty pink anarkali-lehenga for her sikh wedding and looked gorgeous. Loving the gold detailing on her pink bridal lehenga and the way she matched the second dupatta over her head in the exact same pink shade! This bride in a heavily embroidered pink wedding lehenga is a total stunner! Love her deep neck sweetheart blouse paired with a heavily embellished lehenga skirt and the way her dupatta is kept in place with a belt! This light pastel pink bridal lehenga is a sight for sore eyes. Can’t take my eyes off her lehenga skirt with rose motifs. It’s so subtle yet so elegant! The white floral kaleeres totally helped complete the bridal look! Can’t get over this bride’s dusty pink bridal lehenga she wore for her sangeet function. The silver work goes very well with the dusty pink shade! This bride literally went pink all the way. She has matched her pink bridal lehenga to her pink floral decor and floral jewellry. Love the pop of gold with her jazzy dupatta. This pretty bride opted for an ombre pink banarasi silk lehenga in a cute pastel pink colour. Keeping in mind that it was her mehndi function, she did the right thing by opting for a fabric like Banarasi silk which is light and comfy. This dark pink velvet bridal lehenga exudes some major regal vibes right? In love with this Sabyasachi creation with heavily embellished lehenga skirt paired with a double dupatta with one being of velvet fabric, while the other one draped on her head being made of sheer net. If an all pink bridal lehenga is not your thing, then you can totally opt for a lehenga design like this. Love how this bride has paired a beige choli with a pink bridal lehenga skirt and gold jewellry. For her Anand Karaj ceremony, Neha Dhupia made a beautiful bride wearing a pastel pink lehenga from Anita Dongre. Love the coral pink and mint green embroidery on it! The minimal makeup on her face just added to the elegance quotient of her entire bridal look. You can check out more pastel pink lehengas here! This bride decked in an all-pink bridal lehenga with golden embroidery on it is pure love. This Anita Dongre creation with double dupatta is total wedding outfit goals! Sonam wore a gold and dusty pink bridal stealing a million hearts in Veere Di Wedding. I am in love with this fish tail lehenga skirt paired with a sequin encrusted bustier and checkered embroidery cape sleeves. Well, VDW was all about wedding outfits only, check out all the details here! You know who else loves pink? Yes, it’s Mira Rajput who looked stunning in an Anamika Khanna creation with zari and zardosi embroidery on it. Totally adore the pink bangles complementing her pink bridal lehenga! Totally apt for a diva bride - this baby pink bridal lehenga with golden sequins is all that you need to feel like a princess on your big day. Love how she has opted for the double dupattas, giving more volume to the whole bridal look! Yet another Bollywood celebrity who wore pink is Bipasha Basu! She wore a pastel pink bridal lehenga from Arpita Mehta with a floral pink print on it & looked her sassy self. Totally in love with the embellished choli-jacket with a mid-slit paired with a lehenga skirt with floral print on it. This pretty lady opted for a very understated pastel pink bridal lehenga with a cropped lehenga skirt paired with a mid-slit jacket and looked stunning. Her minimal jewellery and make-up were all that was needed to complete her mehndi look. A yellow and pink bridal lehenga combination will never fail you. Dont believe us? Look how how beautiful this bride is looking in a pink and yellow banarasi lehenga on her mehendi. This knock out pink lehenga-choli with a touch of bluish-grey lehenga colour combination is pure love. Seriously digging those grey and yellow latkans on the pink bridal lehenga skirt though! This is from a Masaba Gupta’s recent collection and its total wedding goals! Gold & pink is another colour combination to look forward to! This gold and blush pink bridal lehenga colour combination is gorgeous. What I love the most about this pink bridal lehenga is the golden detailing and the peplum blouse, making it look so unique! 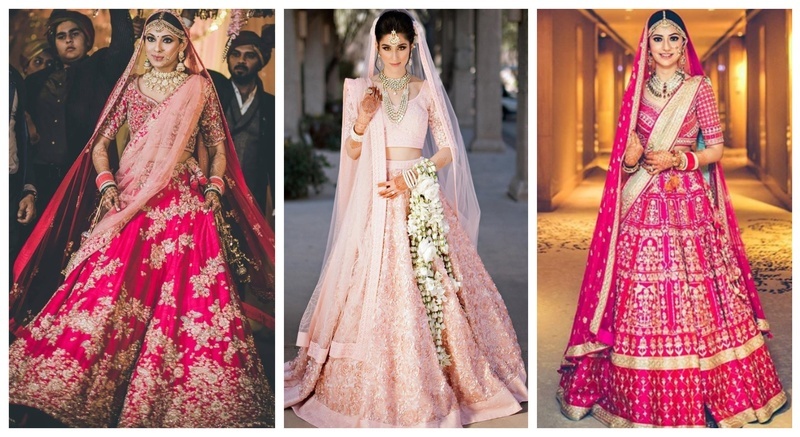 So, which pink bridal lehenga would you pick for your wedding function?